Shield play an important role in ensuring that all of our products produced here at Beatrice carry the shared identity elements that help unify all brands in all markets. Introduced in 1984, this Beatrice logotype has been synonymous with quality.As part of the Beatrice Shared Identity Programme, the Beatrice red stripe logo band is featured on all products that are directly manufactured by our Beatrice Foods company subsidiary. 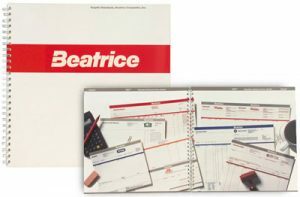 Introduced in 1984 by Legacy Beatrice, and then discontinued in 1987 for a more simpler approach, the Beatrice Graphics Standards Manual was reintroduced by the New Beatrice in 2007, and is the single most important marketing and standards manual that Beatrice uses to convey our branding image to our customers, vendors and employees. Who could forget Beatrice Cooke Mealtime Adventures from the late 1940’s through the 1950’s. This iconic figure was featured in numerous magazine advertisements and would have recipe ideas that featured Beatrice products. Now, after fifty years of absence, Beatrice Cooke is back home at Beatrice, and ready to share cooking ideas and recipes from our very own Beatrice Kitchens. This retro figure is the corporate sponsor of our company. To pay special homage to legacy Beatrice, Beatrice Companies reintroduced the Beatrice Shield on the signature block of some of our Beatrice Foods Company products, and on our web site. This shield was created in 1969, and was used intermittently through the 1970’s and early 1980’s.